Pit Crew Panic! 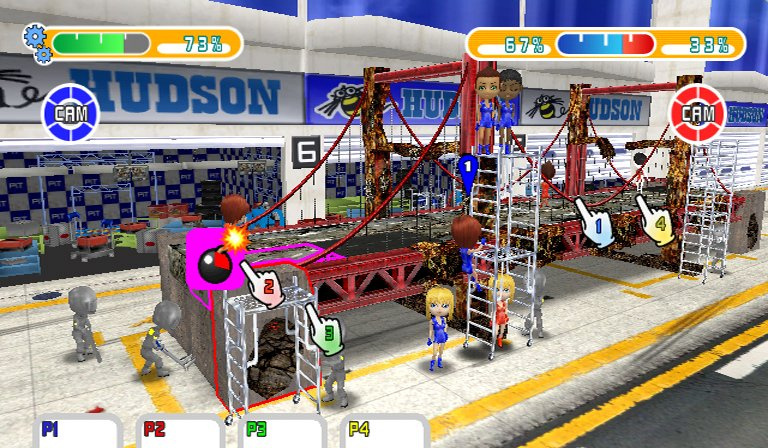 marks the sixth WiiWare release from Hudson and easily their most unique release to date. 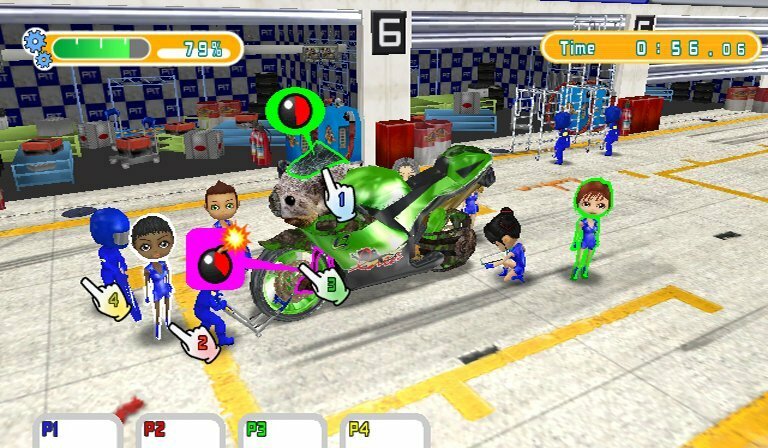 While the title of the game would lead you to believe that you're in for a little auto racing pit crew action, you'll quickly find that you're in for a very different pit crew experience altogether. Instead of whipping tires on and off the car and topping off the fuel, you're going to be conducting repairs on everything from potted plants to Sherman tanks and everything in between. 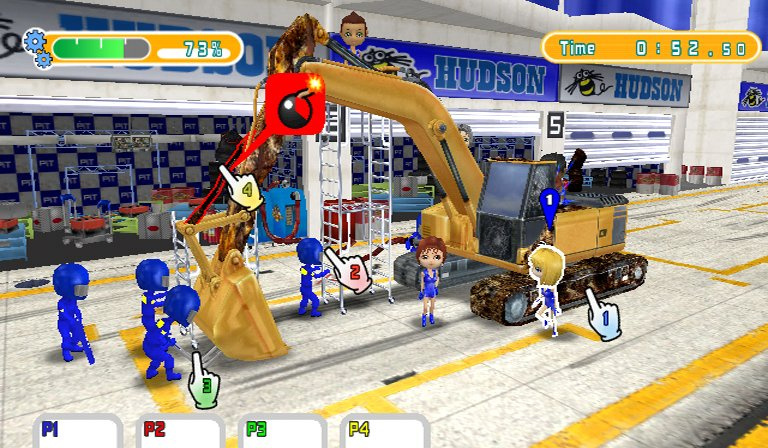 So does this eccentric take on the pit crew idea translate into an enjoyable WiiWare title? 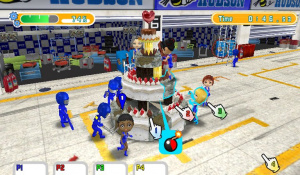 The premise behind Pit Crew Panic! is quite simple. 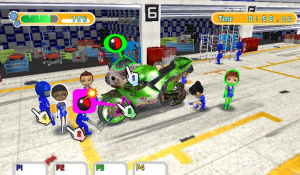 You're put in charge of a small pit crew and your task is to control each of the members and assign them to specific areas of repair on the many interesting items the game tosses your way, called WHATSITs. You basically point to the crew member you want to control and then drag them to the faulty part on the WHATSIT that you want them to repair. Once you've completely repaired the WHATSIT, you can then send it speeding out of the garage, at which time another broken down WHATSIT comes screeching in to take its place. Although you can get away with merely assigning crew members to tasks, if you want to break the speed records you're going to have to help the crew members out by imitating the movements of their tools in order to speed up their repairs. There are basically four modes of play, one of which is a simple Training Mode to familiarize you with how the controls function. 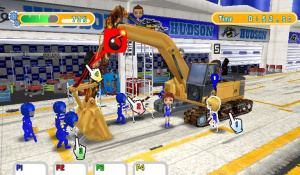 Normal Mode allows up to 4 players to manipulate a single pit crew as they take on repairs. You can choose to either play a Speed Race to try to get the best time or an Endurance Race to see how many WHATSITs you can repair within a set time limit. You can even set the time limits and number of WHATSITs you have to repair to complete each game to your individual liking. Players work together in Normal Mode and each player with a Wii Remote can assign tasks to the various crew members, not to mention help these crew members with their individual tasks. The ability to customize each match gives this mode a lot of flexibility, but the lack of a story mode is a bit disappointing. Abnormal Mode is where the game becomes a bit competitive. This is for 2-4 players and basically allows you to split the pit crews up and compete against each other. The team that manages to do the most repairs on the WHATSITs by the end of the game will win. You can even keep a constant eye on which team has the highest percentage of repairs on the gauge in the upper-right corner of the screen. While this mode can be fun, it can also feel a little cheap at times, especially when one player gets his own crew members in early and the other player has to just wait for an opening to get one of his own crew members in on the action. It might have been better to have a WHATSIT for each team instead of forcing both teams to work on the same one at the same time. For those who like to see their name on an online leader board there's the Ranking Mode, which allows you to take on one of two Time Trials in a race for the fastest time. Your times can then be uploaded to the online leader boards, which will rank your times locally, nationally, and even on a worldwide scale. Time Trial A is a fairly simple and straightforward test that features the more standard WHATSITs. Time Trial B ups the difficulty and tosses a much more intricate group of WHATSITs that feature a lot more moving parts that require repairs. While it would have been nice to be able to compete against other players via the Wi-fi, the leader boards are a decent alternative. The play control in Pit Crew Panic! isn't perfect, but it's still executed well enough to give the game a playable feel that gamers who like to waggle their Wii Remotes will most likely enjoy. Of course long periods of twisting the Wii Remote like a screwdriver or tapping it up and down like a hammer will make your hand tired, especially for those who are going for the speed records in the game. It can also be a little tricky to get your crew members on the right task, especially when the faulty parts are so close together as they are on some of the more intricate WHATSITs, but the longer you play the easier it seems to become. It's certainly not anything revolutionary, but there's at least enough playability here to warrant a look. The visuals on the other hand, are all over the map. While the pit crew members themselves are adequately drawn, they certainly don't show the polish we've come to expect from the current generation of game consoles. The WHATSITs are, honestly, the best part of the game, with quite a bit of detail and texturing. You'll probably get tired of seeing the same WHATSITs coming around time after time, not to mention the fact that you'll always be working in the same garage throughout the entire game, but you won't have much time to sit back and admire the scenery anyway, given the frantic pace. The music and sound effects share a common bond in that there's not much of either, but what there is turns out to be pretty good. 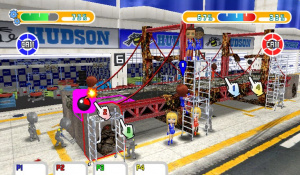 The same musical track plays throughout each modes of play. It's pretty much a sure thing that you'll be hearing this tune inside your head long after you stop playing. It's a catchy little tune, but after awhile it can become a little grating. The same can be said of the sound effects. While there aren't very many of them, the few that are used are extremely authentic. The engine revs are particularly impressive, especially if you're lucky enough to have a really good sound system. It's difficult to criticize the game's audio, but it certainly would have made a lot better impression if there had been more variety. 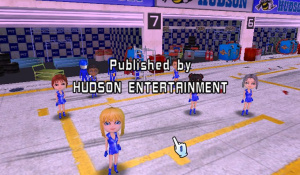 There's no denying that Hudson really took a chance when they stripped away the racing action and instead developed a WiiWare game around the pit crew experience instead, not to mention that they tossed in some of the wildest and most out-of-place vehicles they could think up for gamers to repair. While Pit Crew Panic! might not be the type of gaming experience most people are expecting, the end result is a playable, albeit rather repetitive WiiWare title that might surprise those who are adventurous enough to give it a try. I didn't think it was going to do too well, what with the lack of variety in the gameplay and all, and at the moment I couldn't give a monkeys arse about a European release. Hopefully, Hudson's Snowboard Riot will be a good title. 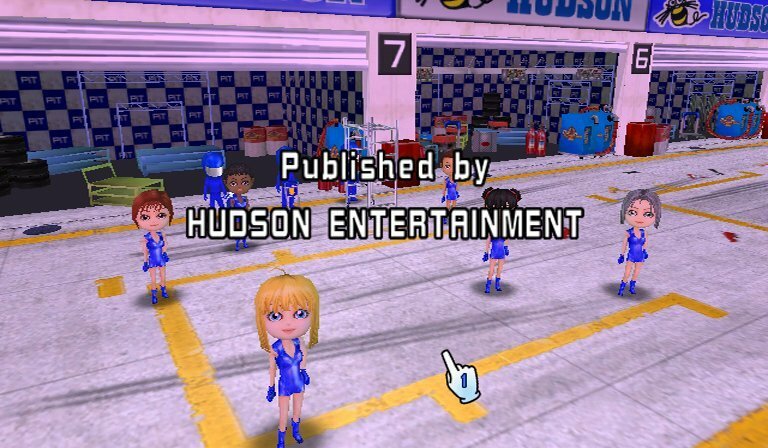 I'm looking forward to Hudson's next title! we'll probably get it tonight Wiiloveit. Along with... I dunno Beer Pong. No, no, no. We are getting World of Goo tonight. I was expecting a six. Great reveiw Corbie. I'd say we'll get this, Sudoku Challenge, Bang and Rotohex tonight. I mean, I'd love if either Gradius or WoG appeared, I just don't think that will happen. @Djungelurban: Bang, Rotohex and Strong Bad Episode 4 look like they are definitely going to be released. Sudoku Challenge is a likely possibility, alongside Beer Pong, this and World Of Goo. If I don't get WoG before Christmas though, then I'm going to start a parade to the NOE UK dept. protesting against their crappy decision making. WHO'S WITH ME? I expected this game to get a 5 but it looks like my mind is made up about this game, I'll save my points when this is out and see if there's anything worth buying this week instead. I'm with you, because I WANT MABOSHI NOWWWWWWWW! I'm a bit surprised that the US hasn't seen the release of Maboshi by now. They are taking their sweet time with it. I'm with you Wiiloveit, ULTIMATUM is the 18th, you've been warned NoE! I'm thinking next week Corbie. Although I have been saying that same thing for a while now and may continue to do so. I figured it wouldn't do well. Great review Corbie , I though this was shovelware but it ain't that bad after all, I'd buy it if it were 500 points, but no, is not deep enough for me. Pretty much what I expected. And once again, nice job Corbie! This is about the score I expected. Still, I may give it a shot. I found the game uniquely enjoyable. It's nothing groundbreaking, but it has just enough of a twist to make it fun to sit down and kill some time with. It was certainly better than I had expected it to be. We need a few sequels. We need some more cheap games. At least its not 1000 like every other game. [Yawn] - At least it's not "another seven"
It's wierd how we sometimes get price differences. The most notable is Plattchen (1000 for NA, 1500 for EU), but Toki Tori was also 100 points cheaper over here. Wow, I was expecting a 3! Still, I probably won't get this, Not my kind of thing. I might get this someday. 500 points is a great price. I purchased this for my little sister (10 years old) on sunday since she got a Wii for christmas. All in all it's a fun game that you can enjoy in short 30 minute periods. As an aside, she wanted me to get her this game, Art Style: Orbient, Super Mario Bros 3 and Kirby's Adventure and she got all 4. Great taste in gaming this little one has. 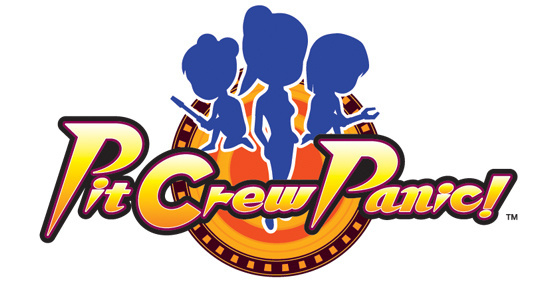 My son bought this game today and I want to note that in the game your crew members are all women and my 8 year-old son was upset by the fact that there is no way to change them to boys. Also my wife was upset by the sexualized images for children. Now... we should have looked at a game-play video before purchasing, so it was a lesson learned. I figured I'd pass this info onto others so they could avoid the same problem. Myself, I thought the game was pretty fun in the little bit I played it.